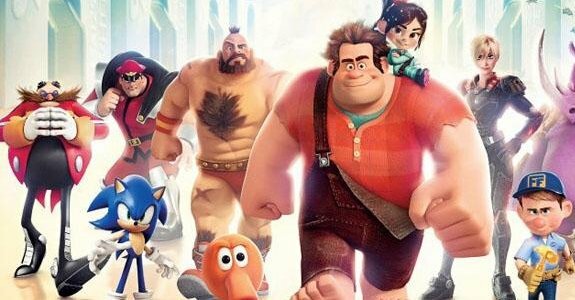 Wreck-It Ralph is a movie I've been following since first glimpsing it in teaser form and have been looking forward to for quite some time as a gamer. As an homage to video game culture, it works, it's got quite a few little references in it that will please the old school gamer in all of us, but as a movie it just works without excelling. 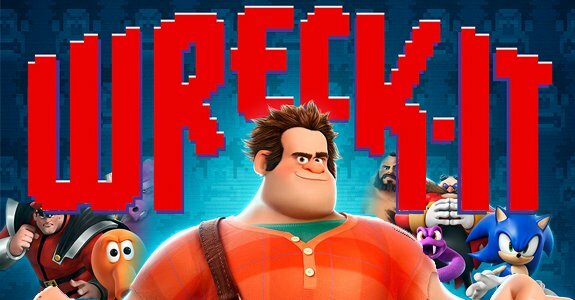 In this film, John C Riley voiced 'Ralph' (or Wreck-It Ralph) is a 'bad guy' character in the 30 year old arcade game 'Fix it Felix' in which his sole goal is to wreck a building which the player then fixes with the 'Fix it Felix' character. The twist and what makes the entirety of the movie worth watching is the idea that arcade game characters do all of this as a work day during the opening hours of an arcade and go back to their normal lives after said shop shuts down. In this world, each character is able to leave their own game via the central station (a surge protector connecting all the machines, resembles a train station) and mingle with other characters, even go into other arcade games or, as the movie starts out, join support groups. It's in this support group that Ralph discusses his unhappiness with being a 'bad guy', having to live in a dump, getting no respect, having no friends and lacking the praise (and pie) that good guys get for saving the day. This is where the cameos start. In Ralphs 'bad guy' support group we see characters like Zangief and M.Bison of Street Fighter Fame, Bowser of Mario fame and myriad of other baddies all dealing with the same issues. Through out the movie various other references are made to other titles like Mario, Street Fighter, Mortal Kombat, Sonic, Qbert, Pacman and Halo to name a few... but the movie never seems to do much with these characters outside of showing them off to make the audience go "Oh! I know them!". Ralph, Vanellope on his shoulder, Calhoun and Felix to his left. Other VG character around. Instead, the movie focuses on the characters made for the movie. Namely, Ralph, his rival Fix-It Felix, a toughened female Sgt Calhoun whom comes from a FPS game that resembles Halo, an adorable Vanellope whom calls home to a cute candy themed cart racer title, King Candy from the same game and a collection of other supporting characters. Each of these characters are well written and exceptionally voiced. Whomever was in charge of hiring the voice talent did an unbelievable job. Each character is believable and emotional in their own sense, each having their own faults and strengths. I was glad the characters were that strong as the story is a bit thin. It's not terrible, but it's predictable and doesn't seem to wander away from what's safe. Ralph, as mentioned above, is tired of being the bad guy, so he sets out to win a medal in another game to earn the respect of the other characters in his game and hopefully improve his life in the process. Ralph jumps into Calhoun's FPS game and through the events in said game is forced to flee into the game for which Vanellope calls home, Sugar Rush. While Hero's Duty (the FPS game which Calhoun is from) is a very dark, super realistic looking game, Sugar Rush is a super colorful, candy filled world in which players cart race for medals. First on his mission to pursue his metal, Ralph runs into Vanellope, a very cute, very determined young girl who's life long dream is to win a race in her cart. But, because she glitches (a term used for something that goes wrong in a video game) the rest of the characters in the game fears that she'll mess with the game and get them closed down, forcing them to lose their home. 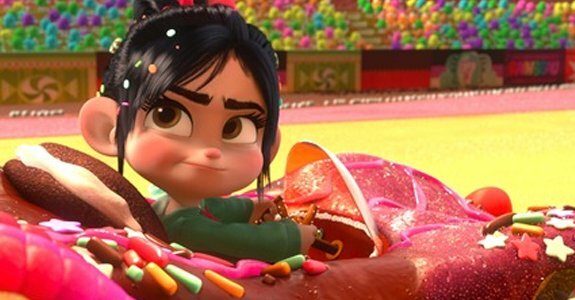 Vanellope, easily my fav character of the movie. A good half of the movie takes place in this world and there are ups and downs through out the story with all of the above mentioned characters. I don't want to spoil anything for you, so I'll leave it at that. But by the end of the movie you'll have had a good time, enjoyed the characters, grooved to the catchy music and if you happen to be of age to remember them, gotten a kick out of the old school gaming references. Sadly though, I wasn't floored by the experience, wish they had done more with the references than just given a nod; over all I feel like a younger child might get more out of the experience than an adult watching it. Which is probably what Disney was going for anyways... but still. I feel it's worth a viewing, but it's not one of those movies I'm itching to go back and watch again, I'll just wait for the DVD.